Originally published in 1984, this book considers the ever-increasing pressure that teachers are under both to demonstrate and maintain their professional understanding and competence. Curriculum development has long been the subject of scrutiny, with some authorities arguing that the primary curriculum should be a diluted version of the secondary curriculum. 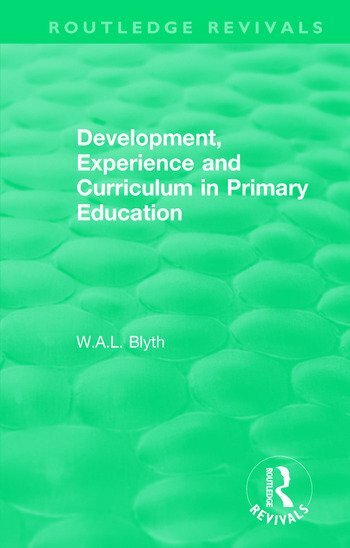 Professor Blyth presents a convincing case for a primary curriculum carefully constructed to enhance the relationship between the various aspects of the child’s development and total experience. Initially examining how children in the primary age range do develop and experience the world, the book goes on to consider the implications of this for shaping the curriculum. These are traced through different aspects of the primary curriculum, from physical, moral and aesthetic development to an understanding of the social world. The book concludes with an assessment of this approach to primary education within an international context and prospects for the future. An important work by a leading authority, Development, Experience and Curriculum in Primary Education is a guide to the professional development of primary teachers, building on their experience and judgement.